New Zealand Art Print News: First New Zealand Print? Recently we came across an Art New Zealand article by R.P. Hargreaves that challenged the place of surveyor Robert Park's "Village of Richmond" as being the first print to be lithographed in New Zealand. The assertion that "Village of Richmond" was the first NZ print was originally promulgated in the groundbreaking 1978 work "Early Prints of New Zealand" by E.M. and D.G. Ellis. 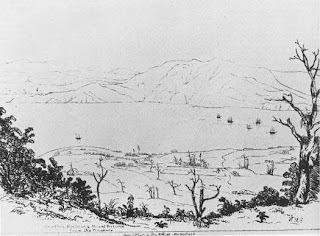 In the article Hargreaves mounts a convincing case for William Mein Smith's "Lambton Harbour & Mount Victoria from the Tinakore" being the first NZ print instead. We spoke to the authors of "Early Prints of New Zealand" about this discovery. They said that they were excited to learn about Hagreave's research as the N.Z. Gazette and Wellington Spectator (used as a source by Hargreaves) was not available to them when they were researching the book in the mid-1970s. They were reluctant to say however that this would be the last word on the issue of the first New Zealand lithograph printed in New Zealand because earlier lithographs could still possibly come to light - or prints could have been made in NZ pre-dating Mein Smith's Wellington view and simply lost to posterity some time over the last 170 years. Shown here is the print "Lambton Harbour and Mount Victoria from the Tinakore [sic]" - this image is from the Hocken Library collection where the only known copy of this print resides.